VIRGINIA AIRGUN HUNTERS – NOW IS THE TIME TO BE HEARD – DEADLINE IS MAY 15. The VA Department of Game and Inland Fisheries currently allows airguns (.35 caliber and above) to be used for deer hunting during the two-week rifle season. The agency is currently proposing regulation changes for their four-week muzzle loader season (which does not include airguns). Tell the agency of your interest in having airguns included in the muzzle loader season. 4 Simple Steps. Click here to get started – https://www.dgif.virginia.gov/regulat…. Senate Bill 72 in Georgia was passed through the Senate on February 21st with a 38-15 vote. It is now in the House and you can stay up to date on this bill and others as well as watch the proceedings live at legis.ga.gov. For information as it happens make to sure to follow us across all social media platforms. 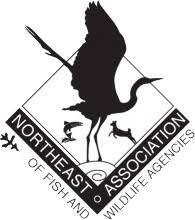 April 14-16 Mitch King from ASA will be attending the Northeast Association of Fish and Wildlife Agencies Annual Gathering in Groton, CT. This includes the states from PA, WV and VA and all others north and east. This meeting will be an excellent opportunity for Mitch to talk to specific agencies regarding their airgun hunting regulations and to seek expanded opportunities for airgun use. There will also be a strong representation of the recruitment and hunter education-related staff and supporting organizations. -How did you get started with airgun hunting? -Who was your biggest influence in the airgun hunting industry? -Tell us about your favorite airgun hunting experience. Thank you to all of the Hunters and Marksman who participated in our Successful Hunter & Marksmanship Program, our gracious sponsors, and Chris from UpNorth Airgunner who helped to facilitate the giveaway! You may also notice two new faces in the video, Ryan & Breann Rehm are joining us and are our new Communications Team. During the recent collaboration and work between the Airgun Sporting Association (ASA) and the Texas Parks & Wildlife Department, many discussions and committee work were accomplished to help push forward regulations in Texas to allow for hunting with airguns and other pneumatic technologies like Airbows / Air Bolts. From those discussions, educational content was documented and clarified to help lawmakers and hunters understand airgun technologies at a much deeper level when applied to hunting applications no matter what state you are from. The following is snippet from an educational article published by Texas Parks and Wildlife that discusses these topics. Air guns and arrow guns function much differently than centerfire rifles or shotguns most hunters have traditionally used to hunt game birds and animals. Therefore, a hunter’s understanding of the limitations of air guns and arrow guns is critical to minimize or avoid wounding loss when hunting and taking game. Before purchasing an air gun or arrow gun, a hunter should check the specifications to ensure they meet minimum caliber and muzzle velocity or muzzle energy requirements for their state. As with any legal method of take, knowing the limitations of your specific equipment is critical to reduce or avoid wounding loss. Hunters should understand that although a number of air guns and arrow guns may meet minimum standards to make them legal for hunting, different brands and models have different levels of ballistic performance and effectiveness. Other factors such as proficiency of the hunter using an air gun or arrow gun, distance to target, and type and weight of bullet or arrow used, all factor in to the ability of that air gun or arrow gun to perform well in the field and deliver a lethal shot. Additionally, the amount of air charged in the reservoir on the air gun is diminished after each successive shot which changes ballistics and ultimately the effectiveness of the air gun in taking game. Hunters should be cognizant of the number of shots an air gun or arrow gun can produce on a fully charged tank before becoming ineffective at taking game. Although big game animals have been harvested with air guns at distances greater than 150 yards, the effective range is recommended to be 75 yards or closer. Beyond 75 yards, the ability of some models of air guns or arrow guns to be lethal becomes diminished, so it is critical for hunters to know the limitation of the model of air gun being used and practice with the equipment just like with any sporting arm. Shot placement into vital organs (heart, lungs) is also critical in order to minimize wounding loss since cause of death from air guns and arrow guns would be more similar to archery or historic muzzleloader equipment rather than that of a centerfire rifle. Similar to archery hunting, hunters taking animals with an air gun or arrow gun are encouraged to wait an hour before going to retrieve the deer or other game animals, allowing sufficient time for the animal to expire. Above all, hunters should strive to take ethical shots which will greatly reduce chances of wounding loss. Recently, we had the chance to talk with our good friend, Chris Turek from UpNorthAirGunner, who discussed the many factors you need to understand at a deeper level to be successful when hunting with a big bore airgun. “A lot of us big bore airgunners that got into this sport bring with us years of hunting knowledge from the powder burner (firearm) world. Some of that knowledge is applicable and some of it needs to be totally reconsidered when hunting with big bore airguns. When I talk with first time big bore airgunners that want to get into deer hunting, I often ask them to totally forget what they know about hunting with firearms and think more like an archery hunter. This mindset starts the conversation to consider shot placement and range to the deer and how those factors become exponentially critical. Currently available big bore airguns on the market today can vary in foot pounds of energy (FPE) from 175 FPE on the lower end to 700 FPE on the higher end of the spectrum. Even knowing the FPE rating for your gun, you need to understand the ballistic effects of the grain weight of your ammo. Your FPE rating will fluctuate based on the grain weight of the ammo you choose sometimes by over a 100 FPE within the same gun shooting very light ammo vs. very heavy ammo for the given caliber. You also need to understand these FPE ratings manufacturers publish are recorded at the muzzle and not at the Point of Impact (POI) of the target. So if you are hunting with a big bore airgun that reaches low 200s FPE at the muzzle, at 100 yards your projectile may only be carrying around 150 FPE at the point of impact. Knowing this should have us airgunners take pause when considering longer range shots. Furthermore, practicing with your airgun at 50-100 yards is critical to learn what your gun will do at the various ranges and velocities (air pressures) and differing ammo grain weights as the trajectory and Point of Impact (POI) will drop by many inches at 100 yards. This last consideration is quite possibly the most important factor when it comes to hunting. You must understand the anatomy of the game you are hunting especially when it comes to larger game species like White Tail Deer. Understanding the specifics of the vital zone shot area of your game and how to choose your shot placement is critical. With big bore airguns you need to avoid bone as much as possible. You want to make sure your shot doesn’t just get to the vitals – but will actually pass through the vitals of the deer for the most effective shot. Also understand the angle at which you are taking your shot. A broadside shot angle is going to have a lot different penetration characteristic vs. a shot on a deer quartering away or towards you. I also talk with a lot of powder burner firearm hunters and they swear by the high shoulder bone shot for deer. Unless you are shooting a highly modified airgun that can shoot 700-1000 FPE and at closer ranges, this shot is highly discouraged with big bore airguns and again, you should really be avoiding the larger bones on a deer. This photo for example was a recent range day where I was demonstrating where the high shoulder shot is placed. 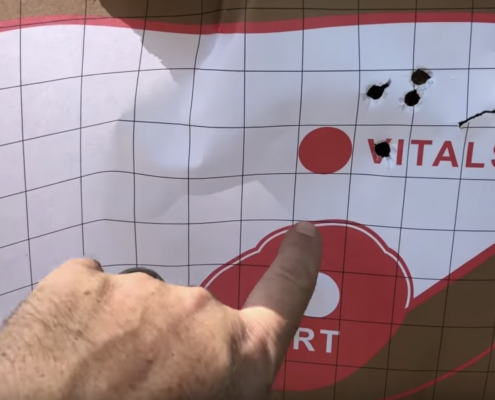 You really want to be aiming for the middle to rear parts of the vitals zone (heart and lungs) for a more effective shot with a big bore airgun. Another aspect to consider with big bore airgun hunting is this… Unlike paper targets, deer have this really bad habit of not sitting still when you are getting ready to squeeze that trigger. Knowing your predetermined primary shooting lanes from your hunting position is always great and having the various yardages visually pre-marked out is a great strategy, but deer also have a bad habit of being “woods ninjas” and showing themselves nowhere near your scouted shooting locations. With varying light and weather conditions you may not have the luxury to pull out your trusty laser range finder to know the exact distance. With airguns, your range estimation could miss that all important vital zone by inches if your range estimation is off when attempting a longer range shot. Deer also have an awesome ability to react to sights and sounds in the woods and you will hear archery hunters talk about the deer “jumping their shot” or “jumping the string”. Big bore airguns shoot at subsonic velocities so the sound of the airgun shot will get to the deer before the projectile and you might still hit the deer, but if ducks – dodges – flinches – or jumps – that hit may not be where you were aiming, especially at longer ranges. So get online and get connected with other big bore airgunners to pick their brains about their hunting experiences. The airgunning community is growing and with the recent changes in hunting regulations that is happening all over the United States, the number of hunters entering our sport will only continue to get larger. Understanding these principles is important before you go into the woods.